Definition at line 3 of file desktop.h. Definition at line 38 of file desktop.h. Referenced by IntGetFocusMessageQueue(), IntSetFocusMessageQueue(), and MsqDestroyMessageQueue(). Definition at line 42 of file desktop.h. Definition at line 40 of file desktop.h. Referenced by IntGetCurrentThreadDesktopWindow(), IntGetDesktopWindow(), and UserGetDesktopWindow(). Definition at line 28 of file desktop.h. Definition at line 13 of file desktop.h. Definition at line 12 of file desktop.h. Referenced by IntQueryTrackMouseEvent(), IntRemoveTrackMouseEvent(), IntTrackMouseEvent(), IntTrackMouseMove(), and SystemTimerProc(). Definition at line 34 of file desktop.h. Referenced by IntQueryTrackMouseEvent(), IntTrackMouseEvent(), and IntTrackMouseMove(). Definition at line 6 of file desktop.h. Definition at line 22 of file desktop.h. Definition at line 32 of file desktop.h. Definition at line 9 of file desktop.h. Referenced by IntDesktopObjectDelete(), and UserInitializeDesktop(). Definition at line 8 of file desktop.h. Referenced by BuildDesktopNameList(), co_HOOK_CallHooks(), IntDesktopObjectDelete(), IntGetGlobalHookHandles(), IntGetLastTopMostWindow(), IntRemoveHook(), NtUserGetObjectInformation(), NtUserMessageCall(), NtUserSwitchDesktop(), and UserInitializeDesktop(). Definition at line 23 of file desktop.h. Definition at line 25 of file desktop.h. 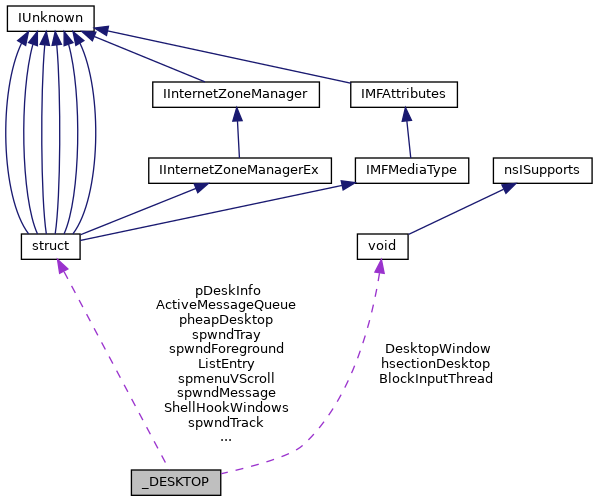 Referenced by IntHookModuleUnloaded(), IntSetThreadDesktop(), and UserInitializeDesktop(). Definition at line 33 of file desktop.h. Referenced by IntTrackMouseEvent(), IntTrackMouseMove(), and SystemTimerProc(). Definition at line 11 of file desktop.h. Referenced by IntDesktopObjectDelete(), NtUserSwitchDesktop(), and UserInitializeDesktop(). Definition at line 43 of file desktop.h. Definition at line 15 of file desktop.h. Definition at line 16 of file desktop.h. Definition at line 14 of file desktop.h. Definition at line 17 of file desktop.h. Definition at line 18 of file desktop.h. Definition at line 20 of file desktop.h. Referenced by IntDesktopObjectDelete(), IntGetMessageWindow(), and UserGetMessageWindow(). Definition at line 21 of file desktop.h. Definition at line 19 of file desktop.h. Definition at line 24 of file desktop.h.